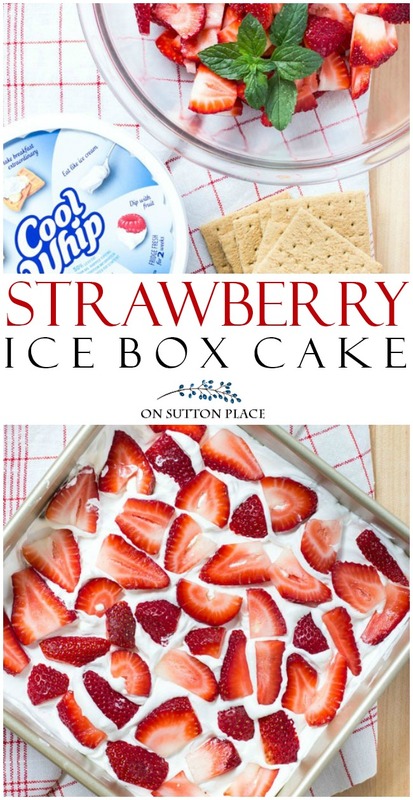 Serve this Strawberry Icebox Cake Recipe when you need a fresh-tasting, quick dessert. It’s an easy, make-head sweet treat! Sometimes I find a dessert idea and wonder why I never ran across it before…and this Strawberry Icebox Cake Recipe is definitely one of those desserts. I must be living under a rock because this is one of the easiest and tastiest recipes I’ve ever made. It tastes incredibly fresh and the best thing is that it lasts in the refrigerator for several days…that is if you can manage not to eat it all at once! It’s assembled in layers and they go together so quickly. Once you get your strawberries cleaned and sliced it takes literally a few minutes. Here’s what to do! 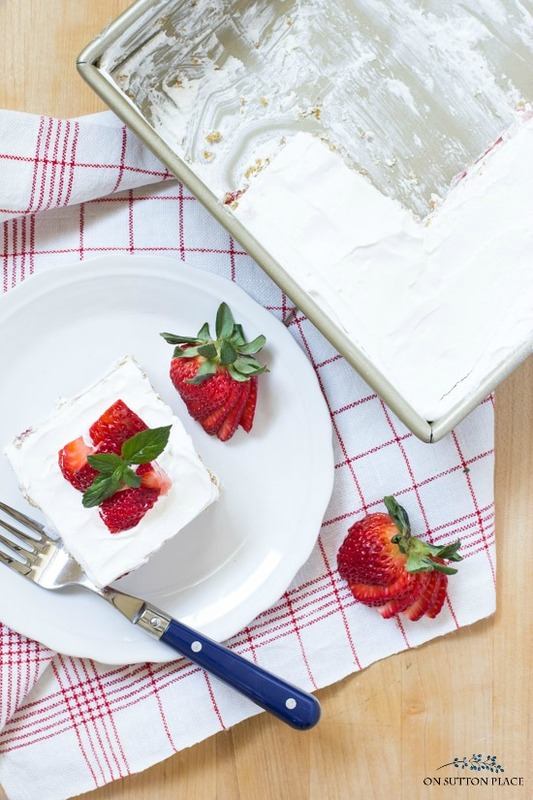 Serve this No Bake Strawberry Icebox Cake Recipe when you need a fresh-tasting, quick dessert. It's an easy, make-head sweet treat! Wash, hull and slice the strawberries. Set aside. In an 9 x 9 square pan, spoon a thin layer of Cool Whip on the bottom. Layer squares of graham crackers followed by another layer of Cool Whip. 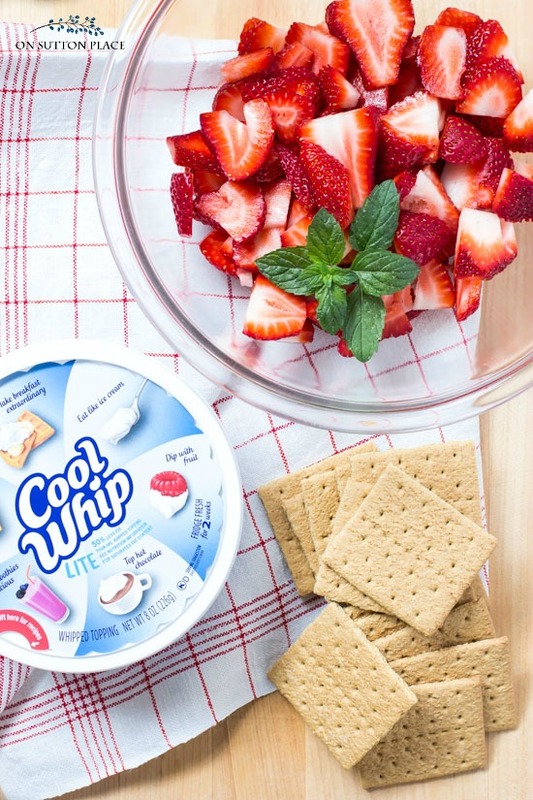 Layer the strawberries on the Cool Whip. Repeat the layers twice ending with strawberries on top. Refrigerate 4 to 6 hours. Can be made the day before and refrigerated overnight. Will keep in refrigerator for up to 3 days. 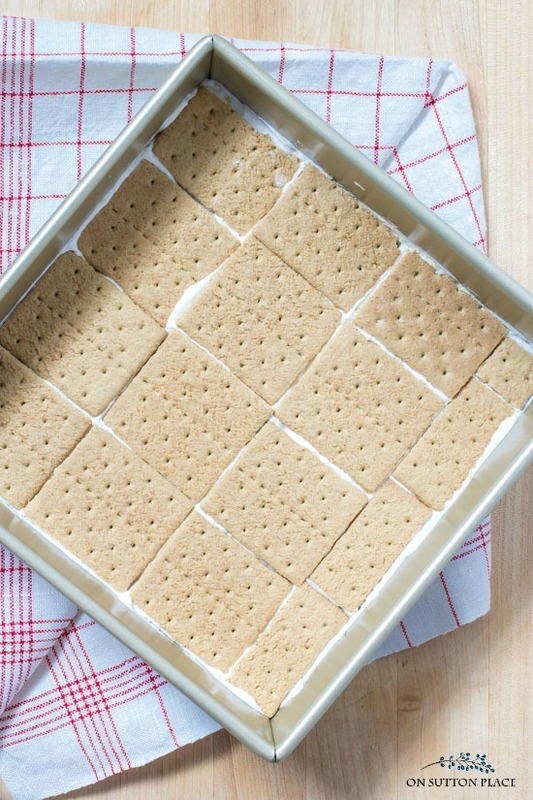 When you are making the layers, it doesn’t really matter what your graham crackers look like. They can be broken and it won’t taste a bit different! Sometimes I get a little heavy handed with the Cool Whip and can only get two layers. When I was making this to take these pictures, I was a little more careful and got three layers. Either way, it tastes the same. I like to save a few strawberries and use them for garnish. Fresh mint looks beautiful as well. If you don’t like the idea of using Cool Whip, you could use real whipping cream. I don’t think it would last as long in the refrigerator. If you were making and eating the same day, then I think it would be delish. 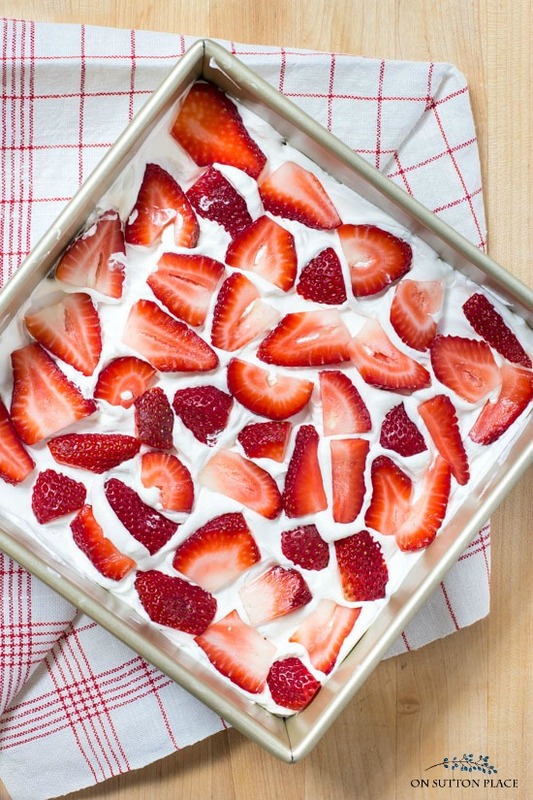 This strawberry icebox cake could easily be made in a 9 x 13 pan if you were feeding a crowd. Just get more strawberries and Cool Whip. You will have plenty of graham crackers if you have a full box. Click to pin this to your dessert board! 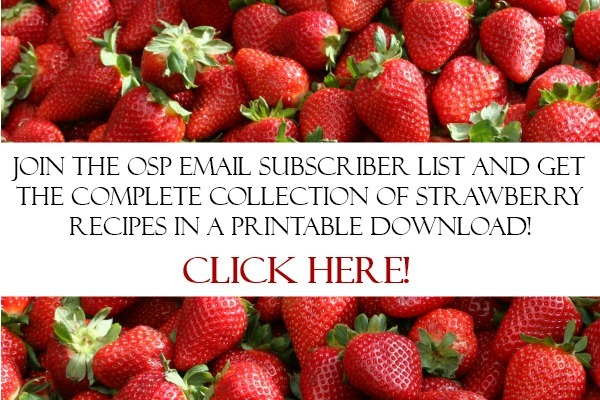 More delicious strawberry dessert recipes! see my favorite kitchen tools! Get your Goldtouch 9 x 9 pan HERE. Thank you, looks lovely! What is this cool whip? Is it same stuff than normal whipped cream but made for last longer? Or does it taste different? Hi Nina! Cool Whip is found in the frozen food section of any grocery store in the US. It’s a whipped topping that tastes somewhat like real whipped cream, but not exactly. It has a lighter and fluffier texture. It does hold up a lot longer than regular whipping cream. Hope this helps! I had this dessert at some house and love look it up and make it to day. It was very quick & easy to make… in frig. now; cant wait to taste😋😋. Sounds amazing! I will make it for my Quilt club, but will use fresh whipped cream! oh man!!! strawberries are now in in florida….cant wait to try this!!! also your other ice box cakes! I hate to cook, but love sweets, this is perfect. Thanks Ann, keep’em comin!! glad I found you. I’m in Ohio and the Florida strawberries are just beginning to come in. I love them too! What an easy peasy summer dessert! Can’t wait to try it. Looks Yuummy and veryyyy easy! Unfortunately I hate the taste and texture of cool whip so I usually skip anything that uses it. Of course sometimes it’s ok to just substitute the real thing. You might like what I make. I mix equal parts of Cool Whip and strawberry yogurt. You can add some strawberries in the mix to make this refrigerator pie/cake with graham cracker crust. Put some strawberries on top. BTW I don’t like pie crust. Ann, thank you so much for this recipe! I have already made it twice, and I plan to make it again for a family get-together this weekend. It’s super easy and super delicious! This looks yummy! Having guest for the weekend , will be trying! Can’t wait to make this for my family..We have lots of Florida strawberries now in stores….Sounds delicious and so easy !! Thanks for posting this Ann! Always looking for new recipes to serve at our Bible Study group. This should be a hit! Thanks for your inspiring blog. Its about the only one I truly love. Looks positively fabulous…..great for this time of year. I will probably make it for Sunday School refreshments. I’m scheduled for sometime next month. Thanks so much for all your delicious and easy recipes…..keep them coming! I finally have my own this year even though i will have to add some others,fresh strawberries are so great for summertime and i have enjoyed picking mine from my yard. Thank you Ann for this wonderful recipe and have a great day. Love it! So easy and so delicious! I am pinning and sharing this over at G+ and FB! Perfect for summer! Bring on the summer! Ann, this looks so good! I am going to try it ASAP. I want some now! Needed this one for this weekend!! Thank you! Pinned it! This recipe looks so easy to do while I recover, my husband deserves this (he loves his sweets) for taking such good care of me. Thanks for posting this and now I’m pinning it! What an easy recipe and it looks sooooo Yummy!!! It is strawberry season and would be a wonderful dessert for a cookout or holiday…..Memorial Day is coming up soon. I can’t wait to give this a try. Thank you for bringing this easy recipe to us.